Have you been experiencing fall in beautiful weather and flavors? 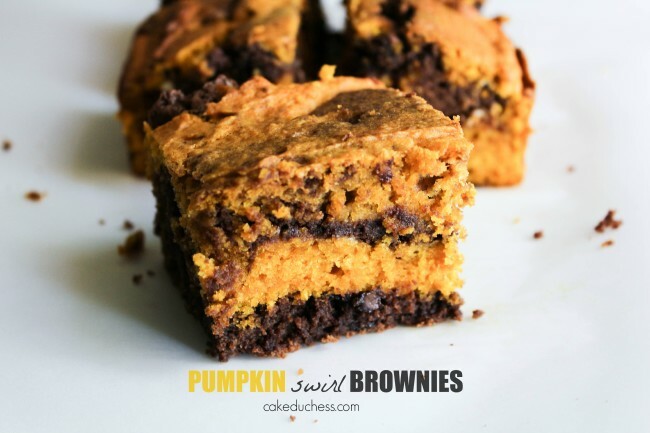 Have you been craving any thing pumpkin? 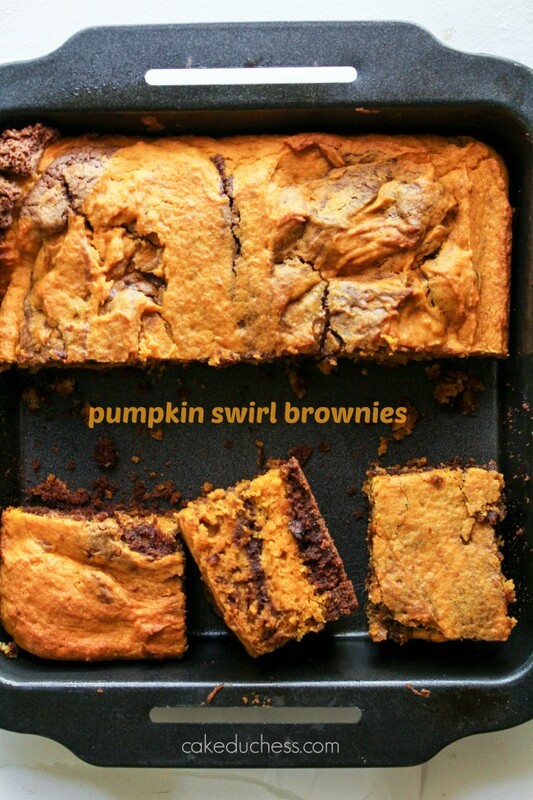 I have and I have been craving these pumpkin swirl brownies! I haven’t made them in a while and thought since the temperatures cooled a little, the timing was right! I was seriously looking at the calendar waiting until the first day of fall happened so I could make something pumpkin and not feel silly. Have you ever baked something pumpkin in the summer? Do you have extra cans of pumpkin in your pantry at the end of fall? I do and I have baked something pumpkin in the summer and it just didn’t feel right. There wasn’t any thing wrong with the recipe and my kids weren’t complaining at all! Actually they were super happy! But for me, it just was off. It was still too hot to pretend fall was around. Now there is no way that it will seem off and I can happily bake away with pumpkin, so I will! If you aren’t much of a pie baker and want to make something pumpkin for Thanksgiving, this is a fun alternative! I wasn’t sure how the swirl was going to turn out this time, as I felt I didn’t save enough of the chocolate part when I was dividing up the batter. But it turned out just fine! I wasn’t sure how the swirl was going to turn out this time, as I felt I didn’t save enough of the chocolate part when I was dividing up the batter. But it turned out just fine! If you want to be sure you are dividing it evenly, measure with your measuring cup when dividing into two bowls. 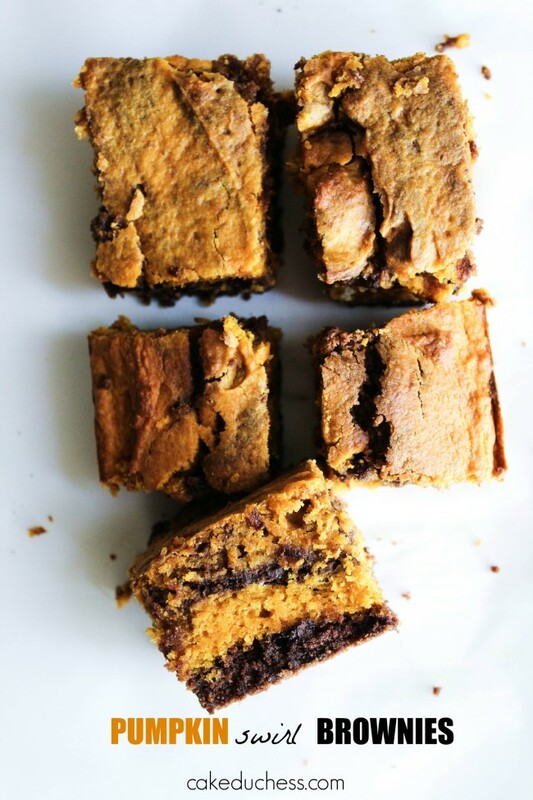 These brownies have a touch of cayenne. My kids don’t even notice it. You could omit the spice if you’d like. If it is for adults, you could add a touch more to intensify the flavor a little. These are a wonderful idea to make during the holidays. They are so easy to put together and they are a hit with everyone! Need more pumpkin ideas? Check out this roundup I put together recently! A favorite is the very easy to make pumpkin spice donuts! And if you are a bread baker, the pumpkin challah is fantastic! Not into yeast recipes? Bake this pumpkin bread (it’s vegan!). Divide batter between two medium bowls (about 2 cups per bowl). Stir chocolate mixture into one bowl that has the batter. In the other bowl with 1/2 the batter, stir in pumpkin, oil, cinnamon, and nutmeg. Transfer half of chocolate batter to prepared pan smoothing top with a rubber spatula. Top with half of pumpkin batter. Repeat to make one more chocolate layer and one more pumpkin layer. Work quickly so batters don’t set. Bake until set, 40 to 45 minutes. Let cool in pan on a wire rack. Cut into 16 squares.